Although Miasma looks like it starts with a grid like the official tangle Chillon, Linda’s deconstruction is different and the variations she shares are made possible by “flipping the basic design in different directions” and from there it takes off on its own. For my example I played with several of Linda’s “flipped” variations but in the end decided to use her basic design with a solid fill. And I turned it around too just to show “there’s no right side up”. 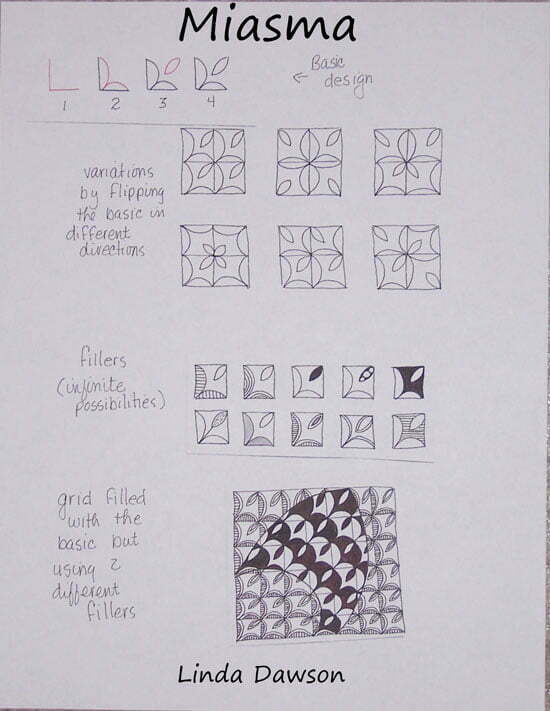 Here are Linda’s steps for drawing Miasma, some suggestions for variations based on flipping the design, 10 suggestions for fillers, and Zentangle-inspired example using her basic grid and different fills. With all these combinations, Miasma can keep you creating in a fog for quite a while. Check out the tag lindad for more of Linda’s patterns on TanglePatterns.com. I love Miasma and all it’s variants. General Question: how best to practice making grid based designs. I’m having difficulty establishing an equal base grid. Any suggestions besides using dots arrayed to layout the grid foundation? You could use an inked dot on one side as a point to aim for. I think the best thing is not to worry about making them perfect. Many of the grid-based patterns looks great with the grid “warped” as I call it, and the hand-drawn look is superior to looking like it was done with a ruler. That’s what Zentangle is all about anyway – no mistakes. If you must aim for perfect, they will get better with practice. Bottom line: relax and go with what you’ve got. UPDATE: More thoughts on my earlier reply about making grids … a good way to establish the start of your grid is to draw a vertical line in the center of your section and a horizontal line across the center of that line, basically you’re forming a cross in the middle of the section. Then you can eyeball where you want the rest of the lines to go by evenly spacing them on either side of the vertical and horizontal baselines. All the lines can be wavy or straight, whatever you choose. Hope that helps! Your several suggestions regarding drawing grids would make a hints section. I love using grid based designs based in curved or warped grids. I think they look best when the integrity of the curve or warp are maintained rather evenly even if I want them to warp smaller then larger in the design. Please continue with your suggestions, a great help. I have had good luck with grid based patterns by pacticing them on graph paper a few times just before putting them into a piece. The “muscle memory” seems to carry over from graph paper to blank paper or tiles. This is a great new tangle. I love these kind of lines and it is so great that it is shown with so many variations. Thanks for sharing your talent! I love these Linda! My daughter and I started working on these as part of her homeschooling art class and are addicted to drawing Tangles. They are so relaxing and really help her stay focused. I would love to teach a class locally. Hi Rose, here’s more information about teaching Zentangle – http://tanglepatterns.com/zentangles/teaching-zentangle%c2%ae. You might also want to check out the Apprentice program, there’s a link for it on the zentangle.com home page. Glad you and your daughter are finding Zentangle helpful! Oh, my, I’ll have to start working on a piece today with Miasma in it; I’ve told my local CZT (Kerry Bowes)about how drawing Zentangle patterns is physically helping me get through a very tough and challenging time, including not really having a place to call home. I think Miasma is going to be one of those ‘tangles I can lose myself in. What a great tangle! So many ways to use it. Thanks for this! Especially enjoy the variations.